There is always something about back to school... the apprehension of a new school year, the excitement of being back with friends, the anticipation of autumn. I always look forward to school supply shopping and most of all, I love picking out a first-day outfit. This is always a result of careful selection, reselection, long spans of trying on outfits, sending pictures to friends for opinions and often a last minute shopping trip. Landing on the perfect outfit always made me feel so confident and ready to take on another year of school. My outfit was simple and comfortable but I chose it for several reasons. First, green is my favorite color and I think it looks the best with my hair color and complexion. Second, it was comfortable and cool for the hot August day in very full classrooms. Third, it was classy and while flattering to my body, it did not show too much off. I finished my outfit with my hair in soft curls, soft makeup, flats, bright red nails and a classic watch to complete the look. I carried a bookbag but I know many people who brought totes to carry their books. looking back, I still am happy with my first-day outfit from last fall. It is important to pick an outfit that, above all else, makes you feel comfortable and embodies your personality. You want your first-day impression to reflect you and still make a good, professional impression. Below are four possible first-day outfits for a variety of styles and all budget friendly! For all those who love the sweet, floral look, this dress is just perfect for the first day of law school. The soft blue dress has a pretty floral pattern that is just so cute and fun while still maintaining a modest and classy look that will make a good impression. I paired it will a simple leather tote to carry books and simple leather sandals for ease of running up and down the stairs at school. I would finish the look with soft curls, dewy makeup, and light pink nails. This overall look is sweet and pretty and will earn you many compliments on your first day. For those who prefer a more casual and sporty look, this jeans and tee combo is perfect. This simple t-shirt has a fun little cross in the back and paired with skinny jeans creates a simple but classic look. I paired it with Tom's shoes instead of sneakers because I think that Tom's provide all the comfort and simplicity of sneakers but a touch more dressy look. I added a North Face backpack to carry the books because every sporty girl probably has a sporty backpack to match. I would pair this with a high ponytail and red lipstick for a pop of color. Overall this outfit projects a casual yet put together look that will make a great first impression. This outfit is so European. I could just see someone strolling down a Paris street in this... or a quirky girl looking for something a little different to wear on the first day of law school. This simple striped boatneck top would be tucked into a classic knee-length skirt in a stylish mustard color. I added strappy flats, a plain black backpack and mustard colored statement necklace to finish this chic look. I would pair this with winged eyeliner and a side braid to complete the look. This outfit may have people wondering if you are actually from France but still projects a confident first impression. I love this simple yet so classy look. This is perfect for those feminine girls who just want to keep it simple and low key. 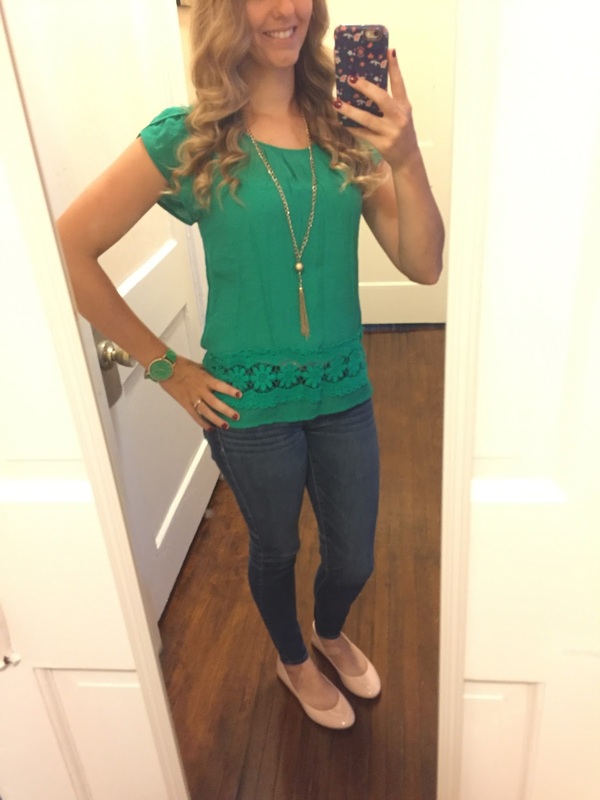 I paired a flowy and soft colored peplum top with simple dark wash jeans. Black pointed toe flats, a classic black watch and a scalloped tote finish off this simple outfit. I would complete this outfit with straight hair, natural makeup, and bright red nails for a pop of color. 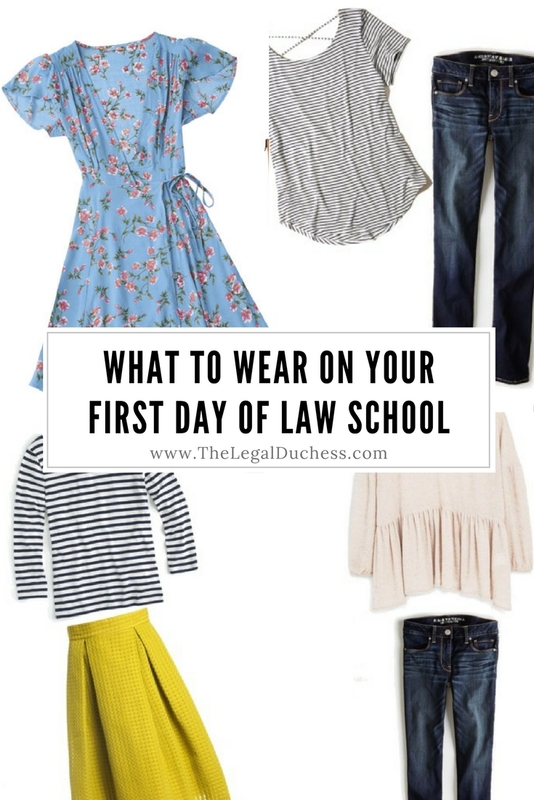 This outfit is so simple yet projects such an image of class and looks so put together and confident- a great first impression for your first day of law school. A good outfit is important but it is most important that you feel comfortable and confident in whatever you wear. Best of luck on your first day of law school!